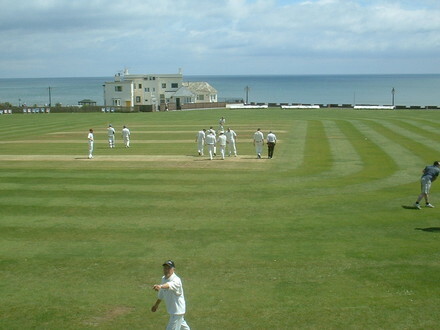 The above photograph shows the club on it's annual Devon tour in Sidmouth. A great social and cricket occasion. Join the club and it could be you ? Collingbourne Cricket Club are a well organised village club with an active junior section and 2 League sides playing 45 overs a side cricket, as well as playing a version of 20-20 cricket in a League on a Wednesday evening (We are also playing some U17 games this year for the first time). The 1st XI play in Division 2 of the Wiltshire League We also have 2 sides on Sundays , playing friendly cricket against local sides and some fixtures against touring sides. We regularly go to exotic places during Easter on an overseas tour. Places visited include Sri Lanka, South Africa and Kenya. (Reports are often in the local papers, look out for the report on our recent visit to Sri Lanka) Our English tour happens May/June every season, visiting Devon every year playing five games against sides around the Sidmouth area. So as you can can see we have plenty of cricket for everyone and are always looking for new players , both young and old.Come and join us. Nets are Friday nights at the ground. give me a ring first.